Podiatry, or chiropody, is a specialty devoted to the study, diagnosis, and medical treatment of disorders of the foot, ankle and lower extremities. So if you have unhappy feet, don’t struggle any further – make an appointment with Angela today. Angela has a special offer for the month of February. 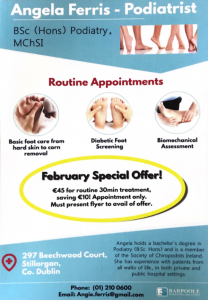 Make an appointment in February and bring a printed copy or a copy on your phone to avail of the offer.